I was conscious of a sudden and wholly unexpected blow on the side of my head. If his foot had not slipped for a moment, my body would have been six stories below in the courtyard. THERE is something about that wide-flung, multitudinous carpet of lights through which one passes when entering a great city at night that has never failed to kindle in my brain and pulses a thrill of excitement. The roar of one's brief passage through the tunnels, the slackening of speed, the momentary glimpse of that lurid blaze of reflected light lowering over the maze of buildings, all minister to that curious sense of excitement that on such occasions, I have never failed to experience. On this particular evening we were an hour late when we groaned our way into St. Pancras Station. A cold thaw was in progress, and the platforms were wet and inhospitable. I marked down a taxicab that had refused a fare into the country, and filled it with my impediments. I was in the act of establishing myself, when I felt a light touch on the shoulder. I looked round to find myself confronted by a tall, weedy-looking man whom I had more than once seen walking up and down the platform as though in search of someone. "If you are going towards the Strand, sir," he asked, "I wonder whether you you would allow me to share your taxi, I've been trying to get one for the last quarter of an hour." I had noticed this person peering into the carriage windows, into the faces of the passengers, and even examining the labels of the luggage spread out upon the platform ever since the arrival of the train. He was of ordinary appearance, and might well have been a city clerk The only noticeable feature about him was the brilliancy of his eyes. "I am going to the Strand," I conceded. "You can come along if you like. Have you any luggage?" "None at all," he replied, stepping in and taking the place by my side. "I came up to meet someone who apparently hasn't arrived." "Is your name Andrew Fuller?" I am not an irritable person, but this man's manner had begun to annoy me. I could conceive no reason why he should display any curiosity as to my name, or why I should satisfy him. "It might be." I answered. "Fuller is quite a common name." After that, he held his peace for some minutes. Just as we were reaching the British Museum, however, where pedestrians were few and the street illumination almost non-existent, I was conscious—I had relapsed almost into a dose—of a sudden and wholly unexpected blow on the side of my head. My hat was dragged over my face and held there. I heard the door of the cab open, and a rush of cold air entered the stuffy vehicle. For a moment or two I was half-stunned. Then I sat up and released myself from my hat, to find myself alone in the cab. I knocked on the window and called to the driver. He pulled up beside the curb. "What's the matter, sir?" he inquired. "The man to whom I was giving a lift," I gasped—"he's gone! Hit me on the head and jumped out." The chauffeur descended and joined me on the pavement. There was no one in sight who in the least resembled my late companion. Any form of pursuit seemed useless, for we had neither of us any idea which way he had taken. I added up my belongings. "My dispatch-box!" I exclaimed. "It was on the seat opposite. I saw him looking at it." "Shall I drive on to Scotland Yard, sir?" the man suggested. I hesitated. I knew what waiting about at Scotland Yard would mean. I was very cold, and I was longing for nothing so much on earth as the warmth of the Milan Court, a hot bath, a cocktail, and dinner. I went over the contents of the box in my mind. There were English and French check-books, letters from my lawyer concerning the investment of a recent small legacy, various unanswered letters of no particular consequence to anybody, a very small amount of money, and a few trifles of no value, I dismissed the idea of Scotland Yard. "No, drive me straight to the Milan Court," I told the man. "I'll make a report tomorrow." He obeyed, and we rattled on.... In the pleasure of my arrival at my destination, the sense of luxury one feels in s warmed atmosphere after a long winter journey, the delight of my bath, the general sense of well-being that filled me with pleasurable anticipation as I tied my tie and prepared to descend to the restaurant, I might very well have forgotten for the remainder of the evening the disagreeable incident in the taxi-cab, but for the fact that, upon leaving the bedroom for the sitting-room, I found my missing dispatch-box upon the table. On the reverse side of the label, facing me, was scrawled in pencil, "Many apologies." I stared at the inscription and then rang the bell. "Who brought this?" I asked, pointing to the box. "I have no idea, sir," he replied. "It was not here five minutes ago when I came in." I looked back in my room and found, as I had expected, the key of my suite upon the corner of the dressing-table. "The latch was down, wasn't it?" I asked the man, with some asperity. "Certainly, sir," be replied. "I had to use my key to get in." "Go and find out from the valet and chambermaid whether they know anything about it," I directed. He disappeared promptly. The box was unlocked, opening by merely pressing the catch, and I examined the contents. They showed signs of having been looked over, but, so far as I could see, there was nothing missing. Presently, the waiter returned. "Neither the valet nor the chambermaid has been in the room, sir," he reported. "Yet someone with a key has been in and left that box there," I pointed out. The man was puzzled, but, on the whole, not greatly interested. "Perhaps you left it in the taxicab, sir," he suggested, "and one of the reception clerks brought it up." "On the contrary." I told him, "I arrived here without it. It was stolen on the way." He was, apparently, a person of little imagination and with many affairs on hand. He edged toward the door. "Well, you're fortunate to have it back again, sir," he remarked, in congratulatory fashion. "Tea at the usual time in the morning, sir? Good night." I hastened downstairs. Now, there are two of the reception clerks at the Milan with whom I am on friendly terms, and the concierge has been my trusted ally on many occasions, but, after a few minutes spent in the recital of my adventure with each one of them, I came to the conclusion that I had never encountered a more unsympathetic trio. The concierge assured me that no stranger had entered the court carrying a dispatch-box the whole of the time he had been on duty, and ventured upon the perhaps obvious suggestion that it had been found, after all with my luggage and taken upstairs. I crossed the court to the reception office, and, to my profound irritation, the same suggestion was smilingly made to me by each of my friends there. It was only then that I realized how improbable my story must sound. To have had a perfect stranger enter my taxicab, knock me on the head and bonnet me for the purpose of stealing my dispatch-box, and then go out of his way to return it to my rooms in mysterious fashion, was a happening that, as it led nowhere, provoked in everyone to whom I told the story a mild and polite conviction that, somehow or somewhere or other, I had made a mistake. On the face of it the incident had no significance; I had been robbed of nothing, and the man who had made the attack upon me had taken the trouble to return his spoils. The story had no point, amounted to nothing. I suppose that is the reason why I failed to interest either of my two friends the reception clerks or the concierge. They edged off to their duties as soon as they could get rid of me, so I was forced to go out and dine with the mystery of the return of my box unsolved, and in a state of irritation, bordering upon anger. PEOPLE have often asked me why I have never married. I realized, not for the first time in my life, the probable answer to that question, when I came face to face with Violet Barrison that night in the lounge at Claridge's. She was unchanged, to me at any rate, fair and slim, with those sweet, thoughtful eyes and lips that seemed always about to break into a smile. As I bent over her hand, however, it seemed to me that the smile was a little further away. "So you're back from your wanderings, Andrew," she murmured softly. "For a few days, And you? You're not. by any chance, dining with Lady Markby, are you ?" "That is just what I am—or rather we are doing," she answered. "And you, too?... How odd? Though we used to meet at dinner-parties sometimes, didn't we? You remember my husband?" I turned to greet him—a short, thick-set man of the Napoleonic type, an eminent financier in the days when I'd known and hated him. We shook hands, and, if I had been disposed to be critical, I should have said that something of the strength had passed from his face during the last few years. The jaw seemed less stubborn, the mouth less rigid, the eyes not so clear. "Are you dining with Lady Markby?" he went on. "I wish these women would be punctual. I want my cocktail. Hanged if I'll wait!... Waiter," he ordered, turning to one side, "bring me a cocktail—no, three. You'll have one, Major Forester?" We sat down together, but we were soon absorbed in the arrival of the dinner-party. I noticed that Harrison drank the cocktail he had ordered, took one from the tray passed around before entering the restaurant, and, finding an odd one, drank that, too. Lady Markby drew me to one side. "I have put you next Mrs. Barrison," she confided. "Does that please you—or would you rather—?" She smiled understandingly, and we took our places at the table. "Tell me about things," I begged my companion. 'What is there to tell you about?" she rejoined. "We are leading just the same old life—one month in Scotland, the season in town, and now Henry has bought a villa at Le Touquet—and we have both taken to gambling a little in our middle age. I have given up hunting. Henry hates horses, and to keep a stable up for one person is terribly expensive." I raised my eyebrows. In one of her unworthy moments, Violet had once told me that she meant to marry for money—a great deal of money. "It doesn't sound like you to be considering expense," I remarked. She seemed to be making up her mind whether to confide in me or not. "Henry doesn't like me to say so," she murmured, "but I don't think we are so well off as we were." That was the sole confidence that passed between us. Just as I was departing, however, Barrison stopped me. "My wife tells me that you've just arrived from New York, Forester," he said. "This afternoon," I told him. "You were on the Audania. Fine ship! I wonder whether you happened to come across a fellow named Fuller on her—Andrew Fuller, I think his name is?" "I don't remember him," I replied, "although, curiously enough, the first person I spoke to at St. Pancras Station asked me whether that was my name. As a matter of fact, I am rather unsociable on board ship. I seldom make acquaintances." "Man of about your height and figure," he remarked. "My people want to get in touch with him on a matter of business. They can't find out his present whereabouts, though." I made my adieus, and thought no more of my probable fellow passenger until I took up my paper the next morning and read that a visitor from America, who had registered at the Milan under the name of Andrew Fuller, had thrown himself from the window of his bedroom, exactly one floor beneath my own, into the courtyard sir stories below, and had been picked up dead. The dead man had, at one time, been a professor of mineralogy and had written two treatises on abstruse subjects connected with the fusion of metals, and was supposed to be engaged on a magnum opus dealing with the same subject, to collect material for which he had been visiting the western states of America. He seemed to hare been fairly well provided with money, and an elderly sister who arrived to claim his belongings was able to give all the necessary information with regard to his means. The general impression up to the morning of the inquest was that the affair had probably been an accident. The windows were unprotected; they pushed outward, and in opening his the unfortunate man might conceivably have slipped, lost his balance, and fallen. It was the view generally accepted by the hotel authorities, and instructions were given for alterations to be made in the width and height of the windows along the whole of the front. THE inquest opened without any fresh evidence, except for the production of a wireless message addressed to Fuller upon the Audania, begging him to stay at the Milan Court and remain there until further notice. It was signed "Larimore." The coroner went through the evidence, and was obviously on the point of directing the jury to return a verdict of "death from misadventure," when a lawyer entered with a new witness, James Tompkins. "Tell us what you know of this affair if you please, Mr. Tompkins," the coroner invited. "In the first place, sir," the witness answered, "I should like to say that I am a very large shareholder in the Andromeda Estates, concerning which there has been a great deal of difference of opinion in the money market for the last twelve months." The coroner inclined his heed. "All the reports from the mine, which is the chief asset of the company," the witness proceeded, "for the last twelve months have been increasingly satisfactory, but I myself and a few other shareholders, without daring to go so far in public, have not been satisfied as to the bona fide nature of the engineer's and manager's reports. We decided, some months ago, to send out an expert to test some of the statements that have been made. "We decided to do so secretly, and for our expert we fixed upon Mr. Andrew Fuller as being absolutely out of touch with commercial life and yet a scientific authority. Mr. Fuller cabled us that he was prepared to make his report upon landing from the Audania." "What is your point, Mr. Tompkins?" the coroner asked, a little pulled. "My point, sir, was the grave reply, "is that the deceased was in possession of information worth hundreds of thousands of pounds. My second point is that the wireless message directing him to go to the Milan Hotel is signed 'Larimore,' which is the cable address of my firm. It was never sent by me." There was a little buzz of excitement in the court. I myself was conscious of a sudden sensation of horror. I seemed to see my dispatch-box in the taxi- cab, with its misleading initials, the face of the man who had begged a lift and made his savage attack upon me—a man who, by some mysterious means, had found access to my rooms in the Milan Court. For a moment I wondered whether my own vague story should not be added to the evidence of the last witness. Then I heard the coroner's pronouncement that the inquest was adjourned for a week. I MADE up my mind that, vague though my connection with the affair was, it was my duty to report myself at Scotland Yard and describe the adventure in the taxi cab. I stopped first, however, at Lowndes Square, to make my apologies to Violet, who had asked me to come and see her that afternoon. I noticed that a limousine was waiting outside, and, as I rang the bell, the door opened and Barrison made his appearance. "You had better come down with me to the City, Ardlow," he said, turning to. someone behind. "I can give you all the notes you require there." The man from the background came into fuller view, walked calmly by me without the slightest trace of recognition, and stepped into the limousine. I stared after him until the butler addressed me. "Mrs. Barrison is expecting you, sir," he said. I followed him across the hall, into a very charming room, opening into the gardens at the back of the house. At that moment, however, I saw nothing. I could scarcely wait until the door was closed behind the servant. Violet looked up at me from her chair with surprise as she held out her hands. "Have you seen a ghost, Andrew?" she asked. "I don't know," I answered. "Tell me, who was with your husband when he left the house just now?" "No one," she replied, except Ardlow—his manager—and junior partner now, I believe." I sank into the chair she had indicated close to her side, for my knees were trembling. It was Barrison's manager and partner, then, who bad been my assailant in the taxicab, who had coveted the dispatch-box with the initials A.F., and who possessed, apparently, the run of the Milan Court. I DECIDED, on leaving Lowndes Square, to postpone my visit to Scotland Yard until the next morning, for I had an idea that before then other things might happen. Precisely as had expected, at half past nine there was a tap at my door, and, in response to my invitation, Ardlow entered. "Can I talk to you for a few minutes. Major Forester?" he asked. "Certainly," I replied. "There are a good many things I want to hear from you." He came slowly toward me. His hair was dishevelled, his tie disarranged; his clothes needed brushing. For the first tune I seemed to discover something sinister in his appearance. "Sit over there," I directed, arresting his approach. "You have nothing to fear," he assured me. "I wanted to find that man Fuller the other day. I knew he was on that train. You answered the description, and you had the same initials. I made a mistake, that's all. I'm not likely to make it again." "You wanted Fuller's report, on your mine, I suppose," I remarked dryly. "Anyway," he continued, "my little effort with you didn't come off. I did my best to make amends. I brought your dispatch-box back again." "Yes," I acknowledged. "How did you get into my room?" "I acquired a pass-key of the suites on this floor and the floor below a week ago," he confided. "I won't tell you how; it might get someone into trouble." "A pass key just now," I remarked, "might be rather a dangerous possession—a key that would have enabled you, for instance, to enter the room below this on the night that poor fellow went out the window." Ardlow moistened his dry lips. "As chance has made you a possible and a very dangerous witness, at this adjourned inquest, you had better understand the whole business, Major Forester," he said. "I'll begin about the governor. I've been with him twenty- two years—since I was nine years old. I've found him a good master. Today I'm drawing my two thousand a year, and I'm coming into the firm. Its honor and stability are just my religion. I can't say more than that." "You certainly can't," I admitted. "Now, let's talk about Andromeda Estates. The firm bought out that company fourteen years ago. We've dealt in the the shares more than anyone else. It's come to be almost the biggest part of our business. The great asset was, of course, the famous copper mine. The shares have stood as high as sixty shillings. You know where they are to-day?" "Thirty. The drop has all been due to the continual attack of that man Tompkins. Somehow or other, he got to know the truth." "The truth?" I repeated. Ardlow nodded. "The copper mine is played out," he admitted. "We've come to the end of the lode. In a couple of years' time it won't be worth working. Tompkins got on to it somehow, although in none of our reports have we admitted a thing. We've gone right ahead as though the lode was inexhaustible. It was Tompkins who sent out Fuller—sent him out to bring back a report." For some reason or other, Ardlow, as he reached the end of his recital, was becoming calmer. "There's something else you must know, Major Forester—the reason why Mr. Barrison, who is an honorable man, was fighting with all his body and soul to keep the Andromeda Estates from crashing. We had other land we hadn't worked, and on the borders of it stands Mount Verneen, around the base of which people have suspected the existence of copper for a long time. Four years ago we knew that our lode would come to an end, and four years ago we knew that, if only we could acquire the rest of the Mount Verneen property that borders on the Andromeda Estates, we could just move our machinery there, and that we should possess a mine more productive, richer in every way, than our old one. But it's been the struggle of years to buy that property. We've had to use subterfuge, bluff, brains and courage the whole of the time, to deal with the Dutch Syndicate that owned it, but never had the capital to work it. "Tonight the whole of Mount Verneen is ours—has been ours, as a matter of fact, since four o'clock this afternoon. If Fuller's report had been published, do you suppose for a minute that this Dutch Syndicate would have sold? Never. That was the position, Major Forester. If Fuller's report reached the man who sent him out, we were all ruined, simply because he and Barrison had been two great opposing forces in a certain section of the market for the last fifteen years." "You have provided me," I admitted, after a moment a pause, "with a very powerful motive for getting Fuller out of the way, but you haven't said a word yet that would excuse your murdering him." "We arrive at that now. 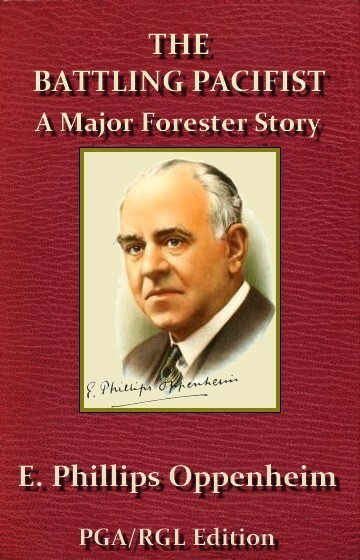 Major Forester. I entered Fuller's room at a quarter past two in the morning. He had gone to sleep in his sitting room, and the contents of his dispatch-box and the letters he had been writing were all over the table. From these I learned that Mr. Fuller, far from being the man of high character, was a thief." "Professor Fuller a thief!" I exclaimed incredulously. "He had been entrusted by Tompkins with twenty thousand pounds to buy certain properties in South America. He had not bought one of them. He had used that money to sell in his own name shares for the full amount in the Andromeda Estates as soon as he had come to the definite conclusion that the mine was ruined. "I possessed myself of all the documents that were necessary to prove what I had discovered, and then I woke Fuller. It must have been about three o'clock by that time. "At first, when he found that I had been tampering with his papers, he was for ringing the bell. I stopped him. I put the case before him plainly. I told him that, if he would give his report into my keeping for forty-eight hours, I would destroy the proofs I had of his misappropriation of Tompkins's money. I told him why. The news, of course, was a shock to him. He had no alternative but to refuse my terms. If he held back the report, and the Andromeda Estates shares soared, he would he unable to replace the money he had used and was a convicted thief. On the other band, my position was none too strong, for, if he put out the truth regarding the mine the next morning, the Dutch Syndicate would fight tooth and nail to avoid concluding the deal, and the Andromeda Estates would drop out of the market. There we were, hard up against it, and we settled it in the only possible way." "We fought," Ardlow confessed. "It was the only thing we could do." He was silent for a moment, his keen eyes seemed to hold in their depths something of fear or awe, as though he himself were amazed at what he was about to recite. "He was a better built man than I, and more powerful, and, Major Forester, I don't mind admitting that I had never fought a man in my life. The first time I ever struck a blow, ever felt a man's grip upon my body, felt the stir and heartbeat, and the throbbing pulses of a hand-to-hand fight, was that night. And we fought for our lives." "Soon after I had awakened him, while we were in the middle of our discussion, Fuller opened the window. He had made up a tremendous fire before he went to sleep, and the room was terribly hot. Somehow or other that black, oblong space, with the few rain drops pattering into the room, the distant lights, the thought of the six stories below, brought to us both, in a single moment, a single thought. I saw it in his face as he glanced toward it, just as he saw it in mine. We had no weapons. We didn't need any after that. There was the window—the window of death!" He drew a soiled handkerchief from his pocket, and dabbed his forehead. I could almost see the little beads of perspiration springing out upon it. "Things didn't go well with me, at first. He was stronger than I had thought, and I didn't seem to be able to control my limbs. Once my head was out of the window, with the rain falling upon it, and, if his foot had not slipped for a moment, my body would have been six stories below in the courtyard. I wriggled back, somehow, into the room, though—I remember how I felt when I came out of that black gulf and saw four walls around me! Then I don't know how I did it. I fought like a mad creature. My whole body seemed on fire, my arms seemed to swell. I suddenly saw him weaken, and I knew that I had him. "We went back inch by inch. I forced him on to the window-sill. Then I got one of his legs. He lost his balance. I didn't wait then. I just pushed him hurtling over, and it was all I could do to keep from screaming. I couldn't watch, but I stood there, gripping the wall on each side of the window with my hands, and listening. I tried to look down, but I couldn't. I staggered back into the room, poured myself out some whisky, and drank it, without knowing what I was doing. "Then suddenly I seemed to become cool. There was no one stirring. I cleared up the papers, put the room in order as far as possible, took what I wanted, left the window open, and got back to my rooms without meeting s soul. "Remember," he pleaded finally, "Fuller was a self-convicted thief who had used his employer's money for his own means. If he had lived, he would have been ruined, because the Dutch Syndicate would have fought to avoid carrying out their contract, and the man who is more than anything else in life to me would have been broken, to say nothing of my own career. As things are, the stockholders in the Andromeda Estates Company will not lose a penny, the great firm of Barrison will remain where it was, and my benefactor, the only honest man in the crowd, will be saved from ruin. At what cost? The life of a scoundrel. You see me. I have no muscle, no real courage. You could throw me out of that window in less than a minute, if you wanted to. I risked my life. He was stronger than I. I happened to succeed and he failed. That's all then, Major Forester," he said. "I thought you ought to know the truth. Good- night." He left the room, closing the door quietly behind him. I liked his last steadfast look, and I liked the courage that enabled him to leave without asking another question. He had insight enough, perhaps, to know that it was not necessary.